Rapala declares Fishing Season open! Activision has worked closely with developer Fun Labs and Rapala, the world's largest manufacturer of fishing lures and #1 fishing brand in the world, to create an angling title that appeals to fishermen and gamers of all abilities. Rapala Fishing Frenzy represents an evolution of the perennially best-selling Rapala franchise by offering precision-crafted controls specifically for each console and visually stunning outdoor environments. 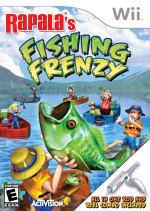 The Wii™ version of Rapala Fishing Frenzy is packaged with a fishing rod controller attachment that takes family fishing fun to the next level. 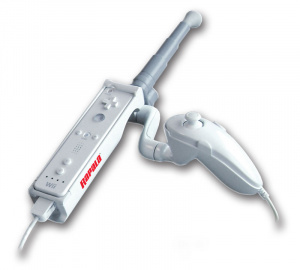 Place the Wii Remote™ in a secure handle and insert the Nunchuk™ into the “reel” - for the first time you have a high quality, licensed fishing rod that will allow everyone from Junior to Grandpa to bring in that monster bass. Take a look at the fishing rod attachment, who wouldn't want that. We've got no official release date for this game outside of America at the moment, but we're sure it's on it's way.